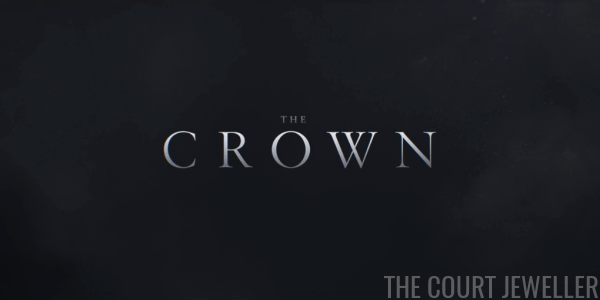 Time for another installment of Netflix's The Crown, magpies! This will be a fairly quick recap, as there weren't many jewels featured in episode four. But that makes sense -- it's tough for anything to sparkle in a fog. 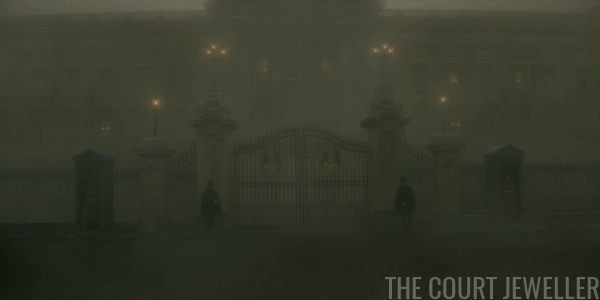 It's December 1952, several months after the end of episode three, and the Great Smog of London -- a real-life weather phenomenon -- has descended over Buckingham Palace. Everybody's dismayed. Philip is miffed that he can't go flying with Peter Townsend. Officials throughout the government are nervous about the political consequences of the weather. And it's getting hard for everybody to travel, live, and breathe. But although visibility is down to virtually nothing, the Queen insists that she must keep an appointment to see her grandmother, who is sick in bed at Marlborough House. Elizabeth is in work mode here, with her Pearly Queen Uniform firmly in place. 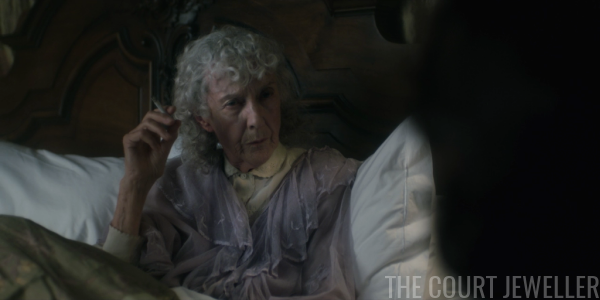 Queen Mary, though, is unwell, and she's not wearing any jewelry at all. Her granddaughter has come to discuss an aspect of the monarchy that's been troubling her: whether or not she's really been chosen by God for the position. Mary says yes -- and that's why it's so important to place duty as one of her top priorities. Mary believes that God made monarchs so that everyday people would have an example to idealize and follow, and that's why Elizabeth's queenship will be confirmed at a religious coronation. 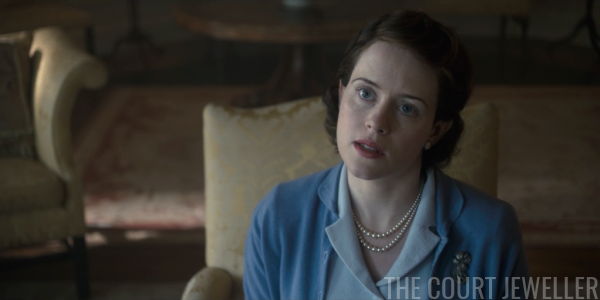 She also tells Elizabeth that she is responsible to God, not the public. The Queen notes that Philip would disagree, because he believes in a separation between church and state. 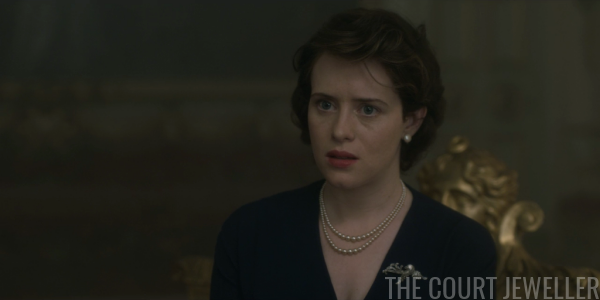 The "Philip as outsider" narrative is confirmed when Mary sniffs that the Greek monarchy ("carpetbaggers and parvenus") isn't the best example of success. The Queen still seems uncertain about all of this. In Downing Street, Churchill is largely ignoring the "act of God" happening outside of his windows. He's chatting with one of his secretaries, Venetia, who is a major Young Churchill fangirl. She's gotten a tad bit obsessed -- reading the memoir he wrote in his youth, clutching his photograph, quoting his words back to him. 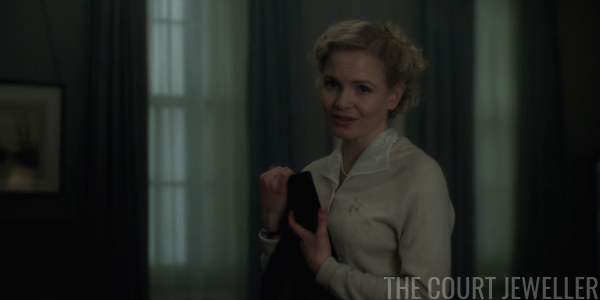 She reminds him that he advised her to find a boyfriend her own age, and she believes she has: Young Churchill. Old Churchill loves it. Old Churchill heads to Buckingham Palace for an audience. The Queen wants to talk about the weather, but he brushes it off. 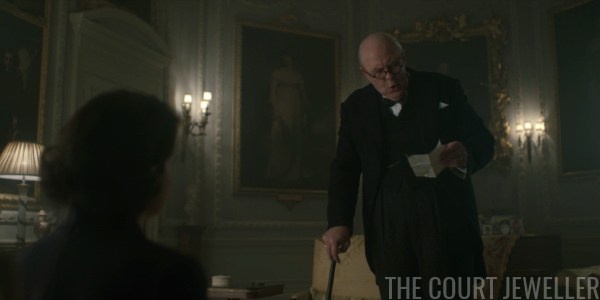 But then she mentions that Philip has been restless because he can't fly, and Churchill is aghast that the father of the nation's future king has been doing something so reckless. Elizabeth is not pleased with the conversation. 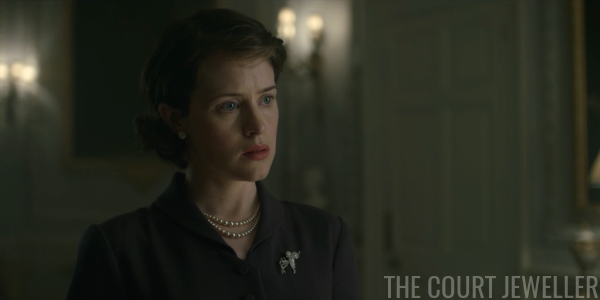 For this meeting, she's in another version of her uniform: pearl earrings, two-stranded pearl necklace, and one of the era-appropriate "inspired by" brooches she's been wearing since episode one. 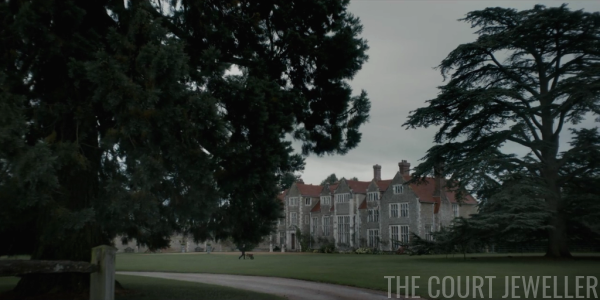 The fog continues on for a third day in London but at the Mountbatten country estate, Broadlands, things are much clearer. Dickie and Edwina are hosting a rousing game of charades, when Dickie is called away to the telephone. 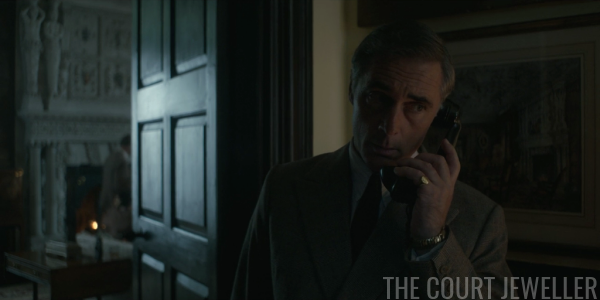 We get a good look at his signet ring -- one of those pieces of jewelry worn by men to act as a visual statement of class and power -- when he takes the call. It's the Marquess of Salisbury, who was the Lord Privy Seal at the time. Like apparently everybody else in the government, he has concerns about Churchill. Dickie heads to Buckingham Palace to meet with the Queen. 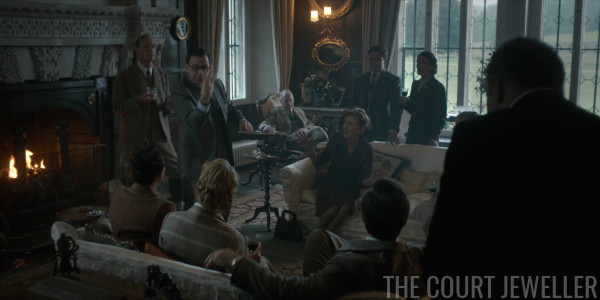 He tells her that there are growing concerns within Churchill's own inner circle that he's not up to dealing with a crisis, like the one happening amid the lingering fog. 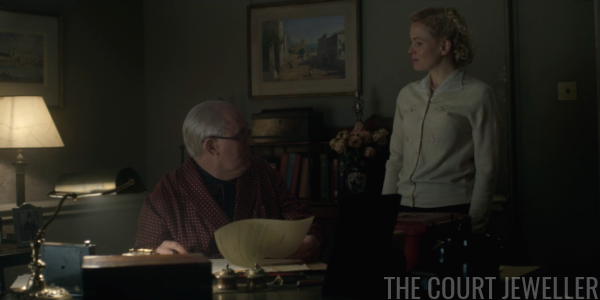 He tells her that she should ask Churchill to resign. Meanwhile, Churchill's number one fan, Venetia, has taken her roommate to the hospital. When she leaves to tell the Prime Minister that he needs to send more resources to help, she is immediately hit by a bus and killed. 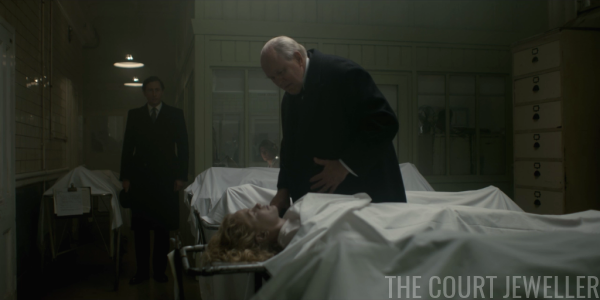 Churchill finally realizes the extent of the crisis when he views Venetia's body in the morgue. You know, I've enjoyed the writing of this series overall, but the plot of this episode bothered me immensely. We've seen Venetia as a background character since episode one, but it turns out that she's never been a real character at all: she's just a plot point. How often do you see female characters in film and television killed as a way to lead a male character to have a revelation or an epiphany? Pay attention: it's an increasing and disturbingly common trope. Ultimately, it's sloppy, lazy writing. Women are so often underrepresented in film and television anyway, and it's just so disappointing when they're included just so that they can become dead bodies for men to grieve over. 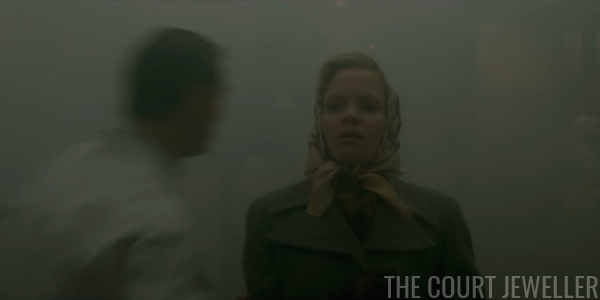 I just can't believe that the writers couldn't come up with a more original, less cliched way for Churchill's character come to grips with the gravity of the disastrous fog. Anyway, Venetia's Magical Corpse conveniently saves Churchill's political career, too. He's captured by photographers at the hospital, and the newspapers trumpet that he's one of the only political figures to truly care about the problems caused by the fog. And then, the fog lifts. This creates a conundrum for the Queen, who has already summoned Churchill to Buckingham Palace, ready to follow Uncle Dickie's advice. 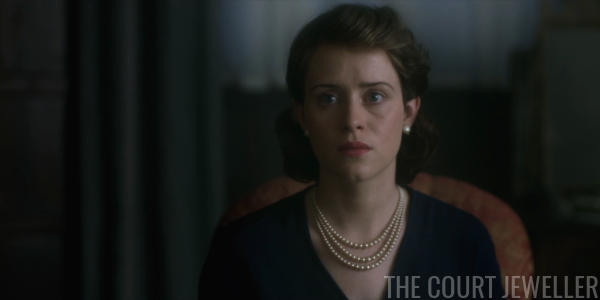 She's got her jewelry uniform on again: two stranded-pearl necklace, pearl earrings, and the other "inspired by" brooch. She can't decide whether to tell Churchill to resign, and in the end, she decides not to. Churchill loves it. 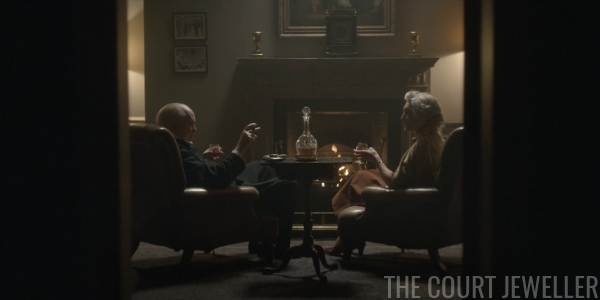 With Venetia's death quickly forgotten, he and Clemmie sit around and chat about his audience with the Queen. He thinks she's clever; because she was able to disarm him with her spur-of-the-moment decision-making, she got him to agree to let Philip continue with his flying lessons. Free from both fog and government interference, Philip happily heads off for another lesson with Townsend. The Queen herself is sort of disturbed by the entire episode. 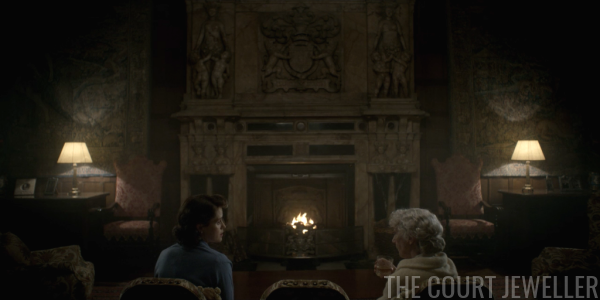 She visits Queen Mary again, and they discuss what would have happened if the fog hadn't lifted and Churchill hadn't pulled off another miraculous comeback. She feels like she has a responsibility as head of state to intervene when things go badly. Mary disagrees: it is hard to sit around and do nothing while situations fall apart, but that's part of the job. Impartiality, Mary argues, is a key part of Elizabeth's job as monarch. The sovereign isn't entitled to a point of view. 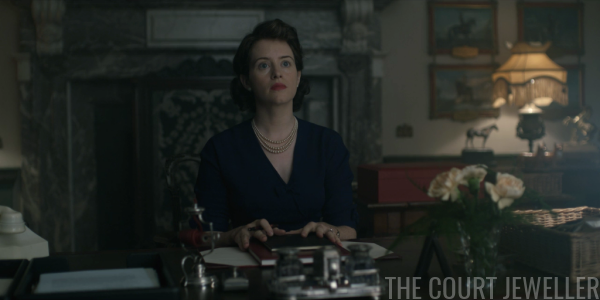 "That's fine for the sovereign," Elizabeth says, "but where does that leave me?" We don't get to hear Mary's answer to that question.